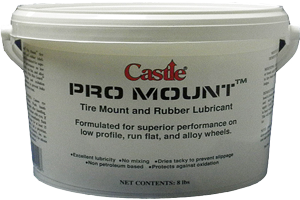 Professional Castle® Pro Mount™ petroleum-free tire mount and rubber lubricant is designed especially for low profile, run flat, and alloy wheel tire mounting. 1. Using a swab or brush, apply to tire beads and both bead ledges. 2. To demount, after the bead is broken from the rim and before demounting, apply to bead with swab or brush.